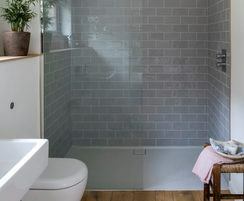 Mandarin Stone supplied a range of tiles for the flooring of a large open-plan contemporary extension & three stylish bathrooms in Dartmoor, Devon. 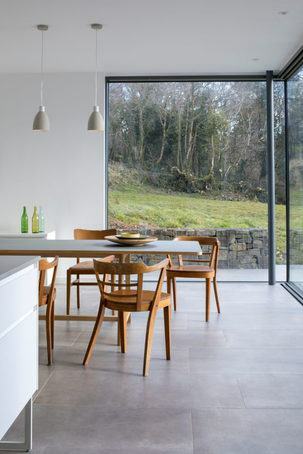 The home had fallen into disrepair before its new owners, together with the help of van Ellen + Sheryn architects, carried out a full refurbishment and contemporary extension. 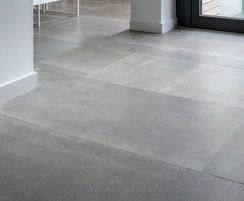 Various porcelain tiles were chosen for the extension and three bathrooms after visiting Mandarin Stone in Exeter. 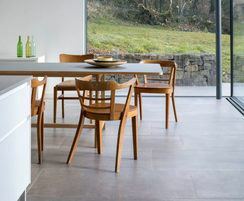 ‘Hessian Grigio’ large format porcelain tiles were used throughout the hallway and into the open-plan kitchen/dining. 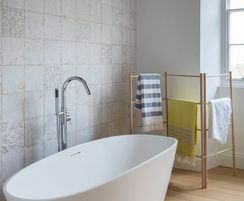 This material provides a stylish, urban-type concrete feel but with interesting texture to add character and a slight vintage feel. It provided the perfect back drop to the contemporary style kitchen combined with vintage furniture and decorative elements. Using an array of products from Mandarin Stone's porcelain and decorative ranges, three stylistically different bathrooms were created.